Hello! 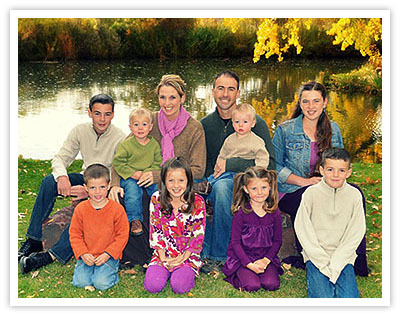 We are Scott and Andie Davidson and we live in Parker, Colorado, with our eight children. Both of us grew up in the mountains just west of Denver and met at Evergreen High School. It didn’t take long for us to catch each other’s eye and start a relationship based on our mutual love for the Lord and desire to minister in any way God would call us. After high school, we both went to Ft. Lewis College in Durango, Colorado. Within two years, we were engaged, married, and starting our little family. Throughout that time we both were involved in missions and campus ministry. After graduation, we spent a year with Youth with a Mission which was a wonderful way for us to grow in our faith and deepen the foundation of our marriage. After returning from this overseas ministry Scott was offered a job as a youth and children’s pastor of our church in Durango, so we settled back down and started having children. Scott served at that church for nearly 6 years, eventually as an associate pastor. In the middle of that time our church granted us a leave of absence to move to Kabul, Afghanistan to minister. After returning from Afghanistan the Lord took us through a season of reverse culture shock which caused us to reevaluate many of our family’s beliefs and practices through the lens of scripture alone. He led us to be open to more children, adjust the way we dealt with our finances and embrace reformed theology. He graciously gave us 6 more children in those years and moved us from Durango to Denver where our extended family lives. Our move to Denver changed many things in our family and opened the doors for us to get involved in overseas ministry once again. We started Paideia Missions as a non-profit ministry that would allow us to serve and minister as well as provide many others with an opportunity to use their gifts for the glory of God! Please stick around and learn more about how you can be involved in Paideia missions! Our mission is to fulfill the Great Commission by promoting Christian Home Education. It is our goal to teach the nations to obey all that God has commanded them in regard to the God-given parental responsibilities towards their own children. We desire to help preserve the faith from one generation to the next by bringing a multi-generational vision of radical obedience to the commands of God. Serve as a resource for families and churches overseas to learn about Christian Home Education.